Happy New Year’s Eve! 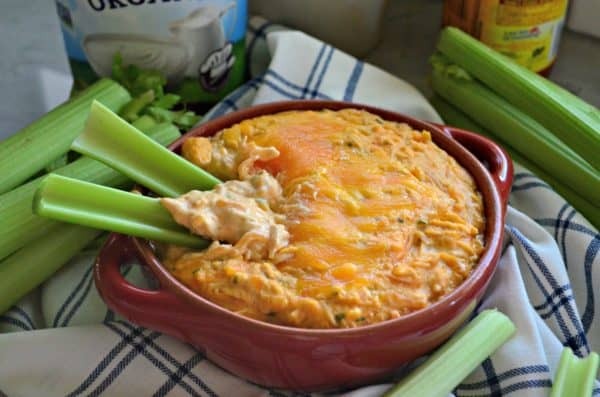 Whether your looking for an easy and healthier appetizer to bring to your New Year’s Eve party tonight or looking to score points with the ones you love during the various bowl games, my Skinny Buffalo Chicken Dip is the answer! 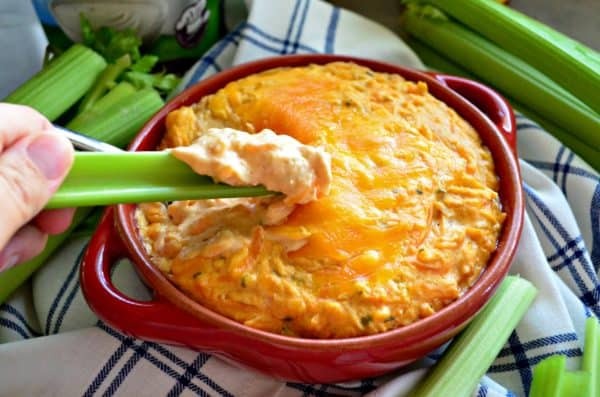 We love buffalo chicken dip in my home, but let’s face it–it’s loaded with calories. I started tinkering around with my go-to recipe and subbed out the sour cream for Stonyfield Smooth & Creamy Double Cream Plain Yogurt and you can’t tell the difference. Hence cutting out some of the calories making this guilty-pleasure dip a little less guilty. Of course I pair the skinny buffalo chicken dip with veggies, and of course you can always add in some gluten free corn chips if you desire. I’m in love with Double Cream it is my go-to cooking yogurt. I’ve started subbing out quite a few ingredients for double cream. Like I mentioned above, Double Cream can be used as a substitute for sour cream but it can also sub out oil, mayo, buttermilk, and even butter. Because it has a higher fat content you can cook with it and it won’t curdle on you. I love having a quart or two of Double Cream on hand at all times. Stonyfield has had a mission of healthy planet, healthy food and healthy people since their start in 1983 on a small organic farming school in Wilton, NH. I love their beliefs and mission and its something that I can feel good about feeding to my family. You guys know I love Stonyfield. Their mission aligns with my own personal beliefs. Everything Stonyfield makes isn’t just delicious, it’s also made with certified organic and organic compliant ingredients. In a world full of choices, organic makes things simple because it’s always made without the use of toxic persistent pesticides, artificial hormones, antibiotics and GMOs. 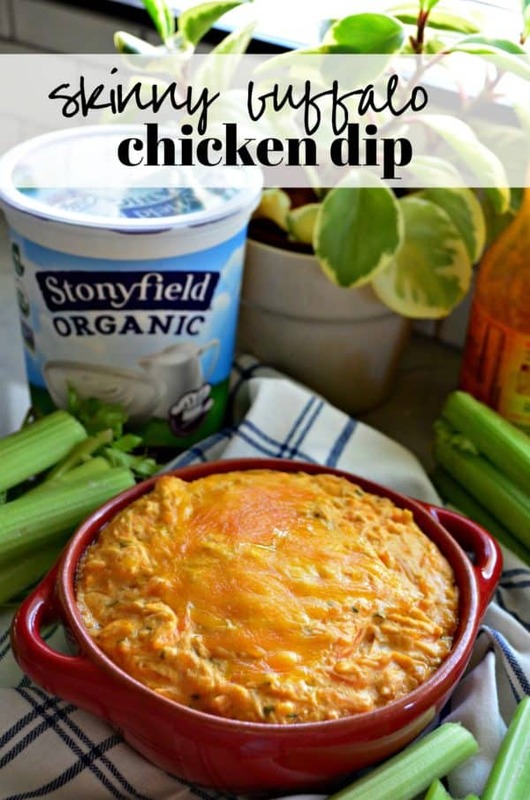 So if your looking to lighten up your menu and still crave that creamy cheesy buffalo chicken dip. 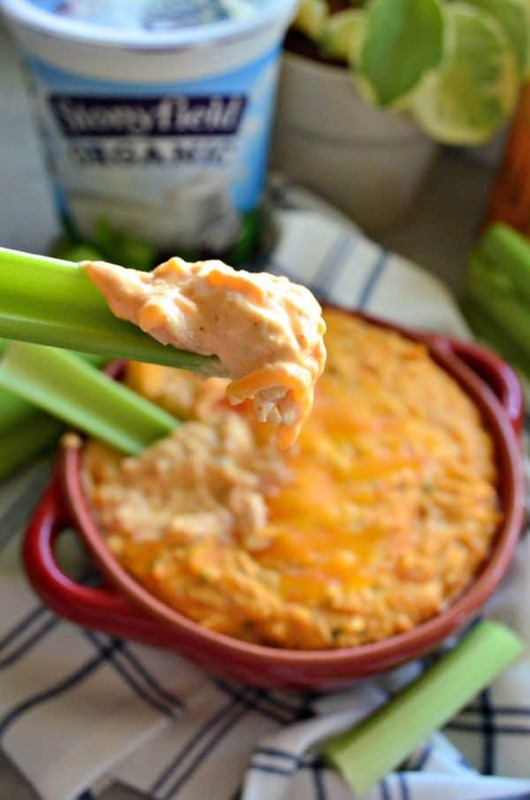 I invite you to try my skinny healthier version of buffalo chicken dip. Preheat oven to 350 degrees. Using a stand mixer fitted with a paddle attachement, add the cream cheese, Stonyfield Smooth & Creamy Double Cream Plain Yogurt, buffalo wing sauce, half the blue cheese, cheddar cheese, parsley, and onion flakes. Beat for one minute on low. Then add in the shredded chicken and beat until all the ingredients are well incorporated. Spray a baking dish with cooking spray, then carefully scoop the buffalo chicken mixture into the dish. Sprinkle the remaining cheddar cheese and bleu cheese on top of the dip. Bake for 20-25 minutes until golden brown. Serve immediately with veggies and tortilla chips.